GIVEAWAY! Book & a Bomb! SONG OF SUMMER. Welcome to the inaugural post of my monthly giveaway series. No, not the exploding type of bomb. A Lush bath bomb that does amazing, magical things to your bathtub. Don’t have a tub? Do what I do, and use half in a big bucket for a lovely foot soak. These bombs are magical, I’m telling you. Lush is anti-animal testing, all-natural, and full of good products for your skin. Even if you don’t like scented body things, bath bombs, when tucked into a drawer of sheets, will make all your linens smell nice. They’re a simple way to add beauty and good smells to your life. And what goes better with a relaxing soak than an enjoyable read? Luxurious baths (or foot soaks) are perfect when paired with a lovely read. 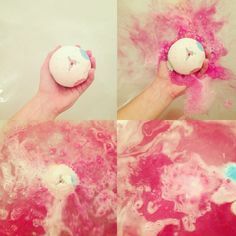 That’s why my giveaway will feature a copy of a book I love, and a bath bomb inspired by the book! For this first giveaway, I’ll be pairing the Lush bath bomb “Blue Skies” with Laura Lee Anderson’s debut YA Contemporary Novel, SONG OF SUMMER. Keep reading for your chance to win! SONG OF SUMMER: The thirteen qualities of Robin’s Perfect Man range from the mildly important “Handsome” to the all-important “Great taste in music.” After all, Westfield’s best high school folk musician can’t go out with some shmuck who only listens to top 40 crap. When hot Carter Paulson walks in the door of Robin’s diner, it looks like the list may have come to life. It’s not until the end of the meal that she realizes he’s profoundly deaf. Carter isn’t looking for a girlfriend. Especially not a hearing one. Not that he has anything against hearing girls, they just don’t speak the same language. But when the cute waitress at Grape Country Dairy makes an effort to talk with him, he takes her out on his yellow Ducati motorcycle. Blue Skies (& Fluffy White Clouds) bath bomb description. Calm your body and mind and slip into a peaceful trance in a tubful of bubbles with our largest bubble bar slice. Exotic frankincense oil has a woody, grounding aroma that blends well with earthy patchouli to relax and restore your state of mind. Lay back and feel yourself float through swirly blue skies and fluffy white clouds of bubbles and into a serene garden of a Far Eastern temple, leaving stress and worries far behind you. For an even greater peace of mind, break your bubble bar in half for two relaxing escapes from the every day. Vegan friendly. To win, enter the Rafflecopter below! This one is open internationally! Reblogged this on Lalaing Around.